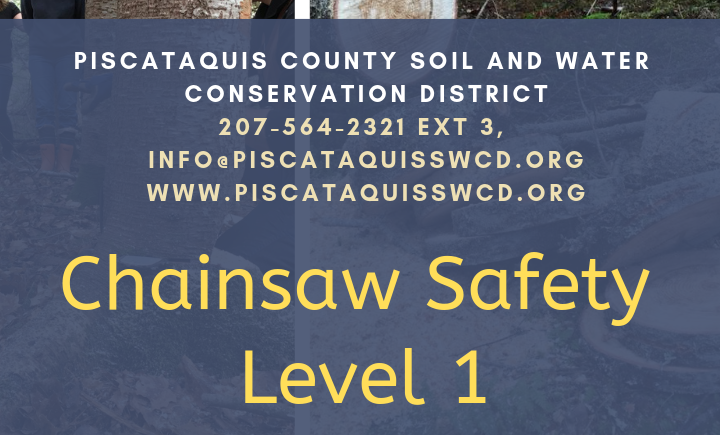 DOVER -FOXCROFT — The Piscataquis County Soil and Water Conservation District (PCSWCD) will offer a Chainsaw Safety Level 1 Workshop, open to all, on Friday, April 26 (rain date April 27th) at the Law Farm, 42 Engdahl Dr. This workshop is designed to demonstrate and comfortably introduce the concept of working with a chainsaw to all experience levels. The Chainsaw Safety Level 1 Workshop will provide participants with a well-rounded introduction on how they should safely handle, maintain and use a chainsaw. We will be hosting presenters Sam Heffner and Pam Wells and together they will provide hands-on instruction, demonstrations and information. Sam Heffner has worked as a forest ranger with the Maine Forest Service for 12 years and has 8 years experience instructing Chainsaw Safety workshops to various organizations. Additionally, Sam was a professional logger for several years, and have competed regionally and nationally in the Game of Logging. Pam and her husband Bryan own 1031 acres of woodland just outside the Orono area, which she works to maintain, enhance and restore. Additionally, Pam is enrolled at the University of Maine in the Forestry Program and has a background in social work. She loves her chainsaws and is looking forward to helping folks get comfortable working with them. Workshop topics will include an overview of chainsaw safety equipment and features, maintenance, sharpening, proper cuts, a step-by-step tree felling demonstration and more.